Vineyards situation : The production area for this wine is the whole of Burgundy. 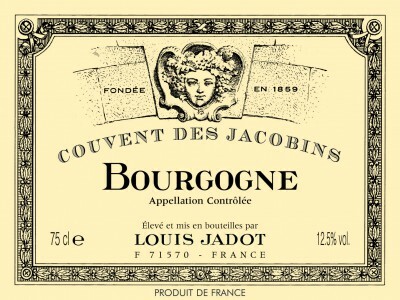 The Louis Jadot Bourgogne Pinot Noir Couvent des Jacobins "cuvée" comes from a balanced blend of Côte d'Or, including Hautes Côte de Beaune and Hautes Côte de Nuits, Côte Chalonnaise (Mercurey) and Auxerrois (Irancy ). Characteristics : The wine will be quite complex because of the different grapes origin : Côte de Nuits, Saône et Loire and Irancy will give structure and tannins whilst Hautes Côtes will gives fruitiness. Wine making : Our Bourgogne Pinot Noir Couvent des Jacobins is vinified in vats by different growers with different styles (depending on the area where the grapes are coming from). The wine is then aged partly in oak barrels and partly in vats during 9 to 16 months before bottling. Winemaker's comments / Gastronomy : This wine is very typical of the Pinot Noir grape grown in its mother land, with its style of little red fruits aromas in its youth evolving to more complex aromas of spices and undergrowth with age. When young, it will be perfect slightly chilled with grilled or broiled red meat. After 2 years, it will be perfect with more sophisticated dished like mild game or soft cheeses. Preservation : This wine can be kept 5 years and even more depending on the vintage and conditions of storage.